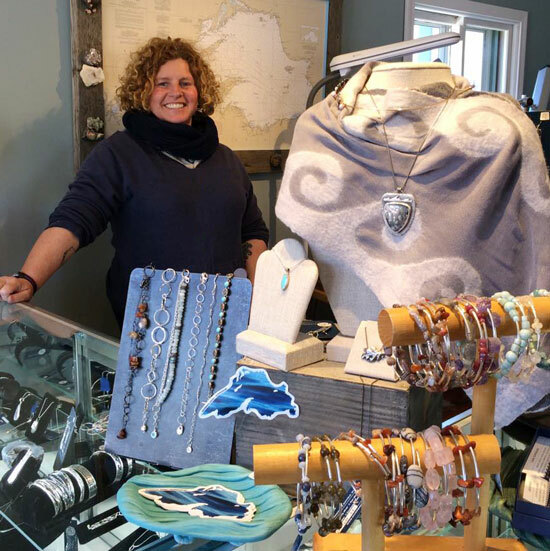 BAYFIELD FESTIVAL OF ARTS "BEST OF SHOW" winner (2014) Lissa Flemming opened Silverwaves Jewelry, an art gallery & working studio in Spring 2016. On display you will find her work, alongside a few select artists who are inspired by Lake Superior. 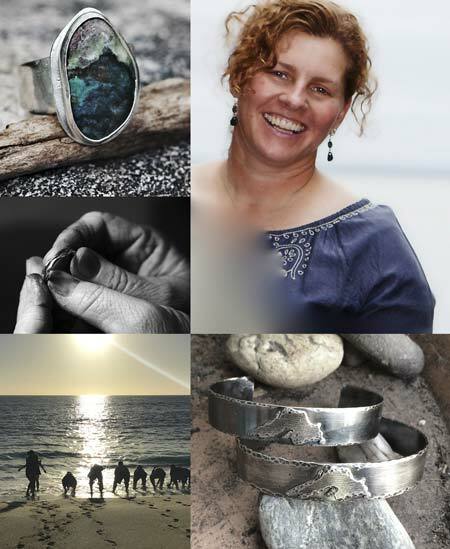 A biologist turned metalsmith and 18 year resident of Baja, Mexico, Lissa has been living in Bayfield, WI for 20 years. Her unique perspective and travels, fuel organic jewelry designs which masterfully incorporate the majestic beauty of Lake Superior and the natural world. “I finally figured out where I should be: hand forging jewelry next to the Lake I respect and love. It took a while, but every adventure, sorrow, joy, moonrise, cup of tea, workshop, etc has brought me to where I am and is reflected in my jewelry designs. I am inspired by Lake Superior and its waves and ripples; the trees moving in the breeze and the pebbles along the shore. Setting native stones from around the Lake with organic sterling frames is my passion: Lake Superior Agate, Mohawkite, Thomsonite, Greenstone, Basalt, etc…and I also use stones from all over the globe including Larimar, Bumblebee Jasper and so many more. " Be sure to check out the photo of Lissa’s mom, Lettie, hanging next to her bench. Lettie’s kindness, creativity and soul lives on through Lissa and her work. The gallery has been evolving since I started to make jewelry. All the classes I’ve taken; the places I’ve worked; the adventures I’ve taken; the tears I’ve shed; and the grieving I do led to it’s opening on May 7, 2016. That was Mother’s Day. I chose that day to honor my mom, who sadly never saw the gallery. I believe the gallery has been and continues to be part of my grieving for the unexpected death of my Mom. I know she is always around—she is the reason it is such a beautiful and inviting place. She taught me those traits and so many more. My mom lives on through me, her friends and family and my jewelry. See the gallery transformation to opening day! Who knew I'd love creating window displays. My latest was in honor of the Royal Wedding: Loretta, one of my manikins, dressed in a wedding gown and wore a tiara with a lovely Silverwaves Jewelry necklace. 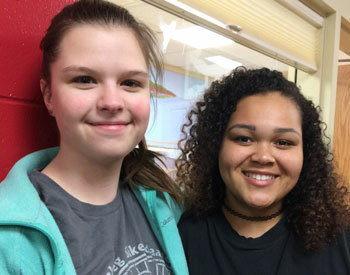 As you first walk into the gallery you are greeted by Lissa and her apprentices, Morgan or Toria, juniors at Bayfield High School. Lissa will probably be at her bench working on a new piece while singing along to what ever tune is playing while Morgan or Toria are busy doing finish work and finding Lissa’s eyes (magnifiers). It’s a fun, comfortable, welcoming and beautiful environment which would not be possible without the help and care of these young women. It is an honor to mentor them and teach them a few jewelry secrets.